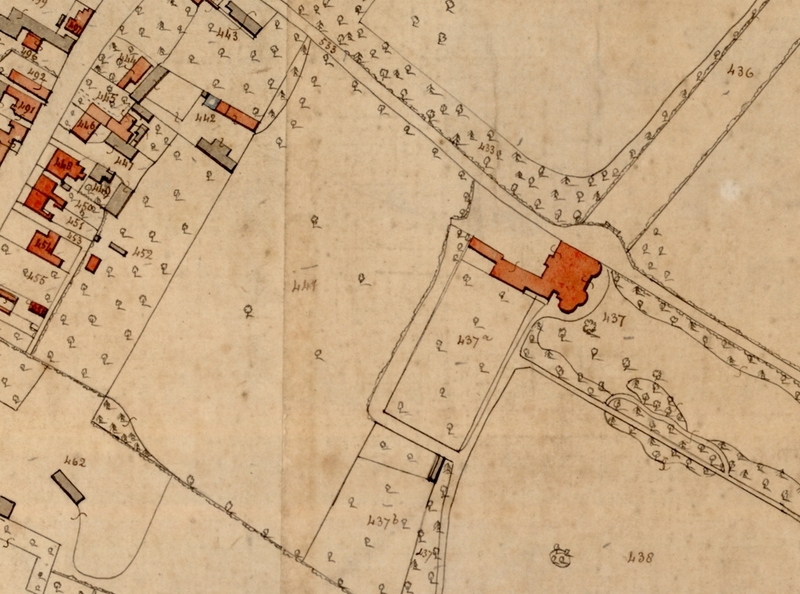 The tithe survey for a parish is an important key to exploring many aspects of land ownership, occupation and use in the early nineteenth century. Using this information as a starting point for analysis, you can work both forward or backward in time to other related sources. The rural landscape of England and Wales in the 1840's is depicted exactly in the field-by-field surveys carried out by the Tithe Commissioners. Their enquiries covered about three-quarters of the country. The maps drawn for each parish show the boundaries of fields, woods, roads, and streams, and the position of buildings, while the accompanying schedules give the names of their owners and occupiers, their state of cultivation, and their area. The amount of detailed information they provide about land tenure, field systems, and land use is unequalled by any other series of documents. Usually three copies of the map and the related schedule (also called the apportionment or award) were made. The originals are filed in The National Archives under IR 29 (schedules) and IR 30 (maps). Copies are often available in relevant county record offices, and digital versions are increasingly available. In most cases, the principal record is the tithe schedule; the apportionment and the map together strictly constitute a single document, however they have been separated in the National Archives. The standard form of schedule contains columns for the names of the landownes and occupiers; the plot number (on the map), acreage, name or description, and state of cultivation of each tithe area; the amount of rentcharge payable, and the names of the tithe-owners. The Tithe Maps are by no means as uniform as the apportionments , varying greatly in scale, accuracy and size. At the outset, the Tithe Commissioners had attempted to secure a uniform and high standard. However in most cases there was no suitable map already in existence, and while there were many skilled land surveyors available, the expense of any new survey had to be met by the landowners. Insistence upon a fixed standard would have retarded the progress of commutation, so concessions therefore had to be made. When the 1836 Act was amended in the following year, a provision was inserted to the effect that, whilst every tithe map should be signed by the Commissioners, a map or plan should not be deemed evidence of the quantity of the land, or treated as accurate, unless it was sealed as well as signed by the Commissioners (Tithe Act 1837, s.1). Approximately 1,900 only of the tithe maps - about one-sixth of the whole - were sealed by the Tithe Commissioners, and it is these alone - called first-class maps - which can be accepted as accurate. The unsealed (or second-class) maps constitute a very mixed collection - indeed, some are little more than topographical sketches. The numbers of the tithe areas on the map correspond to those in the schedules to the apportionment. These numbers are not consecutive. In order to facilitate reference, most tithe apportionments of any size had a numerical key added, showing the page of the apportionment upon which each tithe area appears (these are purely for convenience of reference and form no part of the original documents). Even so, there are traps for the unwary. The same series of tithe area numbers may be duplicated upon a tithe map, due, in most cases, to the fact that more than one township is included in the same tithe district. There are some anomalies and duplications that are not easily explained. Again, different series of numbers may be differentiated by letters or some other sign, either in the original apportionment or in subsequent altered apportionments, as, for example, 22, 22a, 22Aa, A22. Confusion may easily result if care is not taken to observe the absolute correspondence of the number in the apportionment with the number on the map. Over 400 Kent Tithe Maps have now been digitised by the Centre for Kentish Studies on a CD-ROM for each parish. They are now available to view in the three county record offices and are also in the major town libraries for their own areas. The CD-ROM's can be purchased, from either the Centre for Kentish Studies or the Canterbury Cathedral Archives. Many of the related apportionments are available online on the Kent Archaeology Society Research website. Roger J P Kain. The Tithe Commutation Surveys in Kent. Archaeologia Cantiana, Vol. 89 1977 pages 101-118, is also online on the Kent Archaeology site.